The Bubonic Plague also referred to as the Black Death has been included on william-shakespeare.info due to the terrible and major consequences that the disease had on his life. The Black Death received its name due to the combination of symptoms suffered by the victim, but in fact the disease comes in three different forms of the great plague hence the confusion between whether the disease is called the Black Death or the Bubonic Plague. The information regarding the Black Death has been split into three main categories. A synopsis of each category is detailed below enabling visitors to locate the exact subject of their choice. Is the Bubonic Plague still with us today? The picture at the top of this page shows the bodies of victims thrown on to a deaths cart en route to the Plague Pits where the bodies were disposed of. 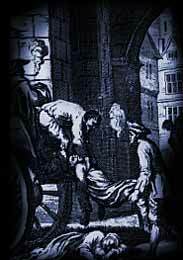 Full details of this gruesome task can be found in the Black Death in the Elizabethan era section.